The Commission should adopt the second series of common safety methods (CSM) covering at least the methods provided for in Article 6(3)(c) of Directive 2004/49/EC, on the basis of a recommendation of the European Railway Agency (the ‘Agency’). On 5 October 2009 the Commission issued a mandate to the Agency in accordance with Directive 2004/49/EC to draw up a draft CSM for checking conformity of operation and maintenance of structural subsystems with relevant essential requirements. This CSM should specify the methods to be used both to check that the structural sub-systems (including traffic operation and management) are operated and maintained in accordance with all essential requirements related to safety and to monitor that the sub-systems and their integration in the systems continue to fulfil their safety requirements when operated and maintained. The Agency submitted its recommendation on the CSM to the Commission, supported by an impact assessment report to address the mandate of the Commission. This Regulation is based on the recommendation by the Agency. To enable the safe integration, operation and maintenance of structural sub-systems within the railway system, and to ensure that essential requirements are met in operation, safety management systems of railway undertakings and infrastructure managers, and systems of maintenance of entities in charge of maintenance should include all necessary arrangements, including processes, procedures, technical, operational and organisational risk control measures. Consequently, monitoring the correct application and effectiveness of safety management systems of railway undertakings and infrastructure managers, as well as of systems of maintenance of entities in charge of maintenance, should cover the requirements for structural sub-systems within their operational context. This Regulation should enable the effective management of safety of the railway system during its operation and maintenance activities and, where necessary and reasonably practicable, should improve the management system. This Regulation should also enable to identify as early as possible non-compliance in applying a management system in ways that may result in accidents, incidents, near-misses or other dangerous occurrences. To manage these forms of non-compliance during operation and maintenance activities a harmonised process for monitoring activities should be used. In particular that harmonised process should be used to check the achievement of the expected outcome of the safety management systems of railway undertakings and infrastructure managers, and check the achievement of the expected outcome of the system of maintenance of the entities in charge of maintenance. The railway undertakings and infrastructure managers should monitor the correct application and the outcomes of the arrangements they have developed through their safety management system so as to operate safely, including on specific networks. This Regulation should facilitate access to the market for rail transport services through harmonisation of the monitoring process to ensure the continuous achievement of the safety performance of the railway system. In addition, this Regulation should help to create mutual trust and transparency between Member States, through a harmonised exchange of safety-related information between different actors involved within the railway sector in order to manage safety across the different interfaces of this sector and harmonised evidence from the application of the monitoring process. To report to the Commission on the effectiveness and application of this Regulation, and where applicable to make recommendations to improve it, the Agency should be able to gather relevant information from the various involved actors, including from the national safety authorities, from the certification bodies of entities in charge of maintenance of freight wagons and from other entities in charge of maintenance that do not fall under the scope of Commission Regulation (EU) No 445/2011 of 10 May 2011 on a system of certification of entities in charge of maintenance for freight wagons (2). 1. This Regulation establishes a common safety method (CSM) for monitoring, enabling the effective management of safety in the railway system during its operation and maintenance activities and, where appropriate, improving the management system. to identify and implement appropriate preventive, corrective or both types of measures if any relevant instance of non-compliance to points (a) and (b) is detected. 3. This Regulation shall apply to railway undertakings, infrastructure managers after receiving a safety certificate or safety authorisation and entities in charge of maintenance. For the purposes of this Regulation the definitions of Article 3 of Directive 2004/49/EC shall apply. ‘interfaces’ means interfaces as defined in Article 3(7) of Commission Regulation (EC) No 352/2009 (3). shall ensure that risk control measures implemented by their contractors are also monitored in compliance with this Regulation. To this end, they shall apply the monitoring process set out in the Annex or require their contractors to apply this process through contractual arrangements. the evaluation of the effectiveness of action plan measures, if such a plan is drawn up. 1. Railway undertakings, infrastructure managers and entities in charge of maintenance, including their contractors, shall ensure through contractual arrangements that any relevant safety-related information resulting from applying the monitoring process set out in the Annex is exchanged between them, to enable the other party to take any necessary corrective actions to ensure continuous achievement of the safety performance of the railway system. 2. If, through the application of the monitoring process, railway undertakings, infrastructure managers and entities in charge of maintenance identify any relevant safety risk as regards defects and construction non-conformities or malfunctions of technical equipment, including those of structural sub-systems, they shall report those risks to the other parties involved to enable them to take any necessary corrective actions to ensure continuous achievement of the safety performance of the railway system. 1. The infrastructure managers and railway undertakings shall report to the national safety authority on the application of this Regulation through their annual safety reports in accordance with Article 9(4) of Directive 2004/49/EC. 2. The national safety authority shall report on the application of this Regulation by the railway undertakings, infrastructure managers, and as far as it is aware of it, by the entities in charge of maintenance in accordance with Article 18 of Directive 2004/49/EC. 3. The annual maintenance report of entities in charge of maintenance of freight wagons set out in point I.7.4(k) of Annex III to Regulation (EU) No 445/2011, shall include information about the experience of entities in charge of maintenance in applying this Regulation. The Agency shall gather this information in coordination with the respective certification bodies. 4. The other entities in charge of maintenance that do not fall under the scope of Regulation (EU) No 445/2011 shall also share their experience with the Agency on the application of this Regulation. The Agency shall coordinate the sharing of experience with these entities in charge of maintenance. 5. The Agency shall collect all information on the experience of the application of this Regulation and, when necessary, shall make recommendations to the Commission with a view to improving this Regulation. 6. The national safety authorities shall support the Agency in collecting such information from railway undertakings and infrastructure managers. 7. The Agency shall submit to the Commission not later than three years after the entry into force of this Regulation a report analysing the effectiveness of the method and of the experience of railway undertakings, infrastructure managers and entities in charge of maintenance in applying this Regulation. This Regulation shall apply from 7 June 2013. Done at Brussels, 16 November 2012. (2) OJ L 122, 11.5.2011, p. 22. (3) OJ L 108, 29.4.2009, p. 4. The inputs to the monitoring process shall be all the processes and procedures contained in the management system, including technical, operational and organisational risk control measures. The activities referred in Article 3(2) of the monitoring process are described in Sections 2 to 6. 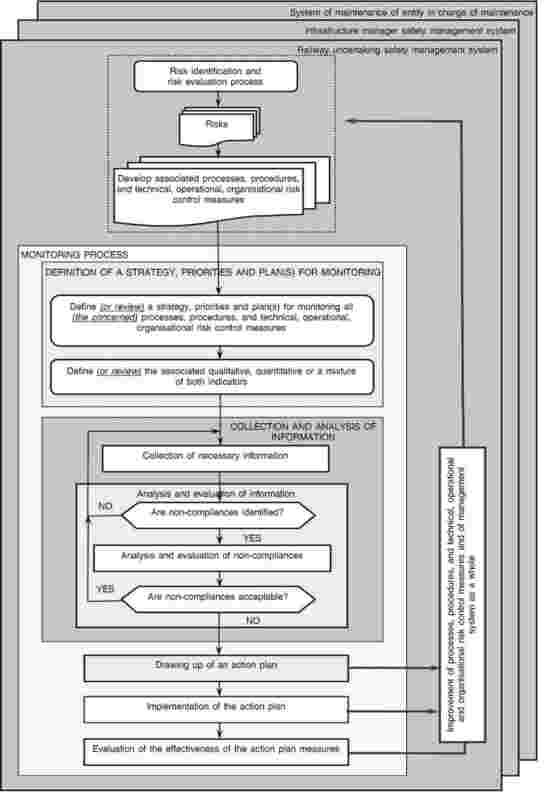 This monitoring process is repetitive and iterative, as shown in the diagram below in the Appendix. Based on their management system, each railway undertaking, infrastructure manager and entity in charge of maintenance shall be responsible for defining its strategy, priorities and plan(s) for monitoring. The decision on what to prioritise shall take into account information from areas that give rise to the greatest risks and, if not monitored effectively, could lead to adverse consequences for safety. An order of priority for monitoring activities shall be set, and the time, effort and resources required shall be indicated. Prioritisation shall also take into account results from previous applications of the monitoring process. The monitoring process shall identify as early as possible instances of non-compliance in the application of the management system that might result in accidents, incidents, near-misses or other dangerous occurrences. It shall lead to the implementation of measures to remedy such instances of non-compliance. The collection and analysis of information shall be carried out according to the strategy, priorities and plan(s) defined for the monitoring. an analysis and evaluation of instances of identified non-compliance with points (b), (c) and (d), as well as identification of their causes. identify and implement additional risk control measures. a review of the impact of the action plan on the monitoring strategy, priorities and plan(s). For managing safety at interfaces the railway undertaking, infrastructure manager or entity in charge of maintenance shall decide, in agreement with the other actors involved, who shall be in charge of implementing the required action plan or parts of it. The action plan defined in Section 4 shall be implemented so as to correct identified instances of non-compliance. Correct implementation, appropriateness and effectiveness of measures identified in the action plan shall be checked using the same monitoring process as described in this Annex. verification of whether other risk control measures are necessary. entities in charge of maintenance shall make this documentation available to the certification body. If interfaces are managed through contracts, the entities in charge of maintenance shall make this documentation available to the respective railway undertakings and infrastructure managers. in the case of instances of identified non-compliance that are considered unacceptable, a list of all necessary measures to be implemented to achieve the required outcome.